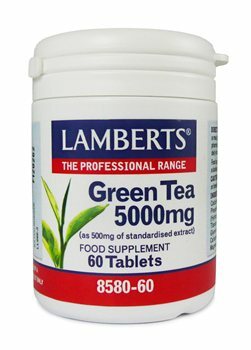 Lamberts Green Tea extract has been sourced from one of the world’s most sophisticated suppliers and is of the highest quality, containing the correct balance of actives. Lamberts Green Tea not only provides a full 250mg of catechins from whole green tea leaves but also provides the important compound L-Theanine. Just one tablet is equivalent to ½ litre of traditionally brewed green tea and contains a fraction of the caffeine content. Green Tea Leaf - 5000mg (Carmellia sinensis) (as 500mg extract). Green Tea Extract, Calcium Carbonate, DiCalcium Phosphate, Cellulose, Tablet Coating (Hydroxypropyl Methylcellulose, Colours: Titanium Dioxide & Copper Chlorophyllin, Glycerin), Crosslinked Sodium Carboxymethylcellulose, Silicon Dioxide, Magnesium Stearate, Stearic Acid. Take 1 to 2 tablets daily with a meal, or as directed by a practitioner or pharmacist.